Look for more updates coming soon! We are excited to announce St. Jerome Academy’s Carpe Noctem Holiday Market 2018 will be held on Saturday, December 1st from 5 to 9 PM. Please mark your calendars and bring your family out to Seize the Night while you sip and shop, perusing the aisles for beautiful, unique gifts. St. Jerome Academy is located at 5207 42nd Avenue, Hyattsville MD 20781. The event features two levels of shopping fun! In addition to many talented vendors , Carpe Noctem offers various dinner options, wine, beer, and tasty desserts, all available to purchase. Children can enjoy face-painting, a photo op with St. Nicholas, and coloring activities. Customers will receive a complementary drink with their paid entrance of $5 into the Holiday Market. All children 12 and under are free! The Carpe Noctem Holiday Market is a wonderful event that supports the students of St. Jerome Academy. The proceeds from this annual fundraising event go directly towards helping fund the cost of our children’s education. Community support is vital to our success and St. Jerome’s has been a member of the Hyattsville community for 75 years. The school prides itself on teaching students in a classical curriculum and is supported by a vibrant and engaged community of families and alumni. When you support St. Jerome Academy, you are not only supporting the school, but the Hyattsville community as well. Welcome back to many of our favorite Carpe Noctem vendors, and a warm welcome to newcomers, too! Here’s our list of 2017 vendors ready to Seize the Night on Saturday, December 2nd. Looking for information on becoming a vendor? Visit our Vendor Information page. This list is current as of November 30, 2017. Check back for more updates! We are excited to announce St. Jerome Academy’s Carpe Noctem Holiday Market 2017 will be held on Saturday, December 2nd from 5 to 9 PM. Please mark your calendars and bring your family out to Seize the Night while you sip and shop, perusing the aisles for beautiful, unique gifts. The Carpe Noctem Holiday Market is a wonderful event that supports the students of St. Jerome Academy. The proceeds from this annual fundraising event directly towards helping fund the cost of our children’s education. Community support is vital to our success and St. Jerome’s has been a member of the Hyattsville community for over 50 years. The school prides itself on teaching students in a classical curriculum and is supported by a vibrant and engaged community of families and alumni. When you support St. Jerome Academy, you are not only supporting the school, but the Hyattsville community as well. Here are just some of the vendors coming to Carpe Noctem 2015! More links & more vendor information coming soon! Carpe Noctem is scheduled for Saturday, December 5, 2015! 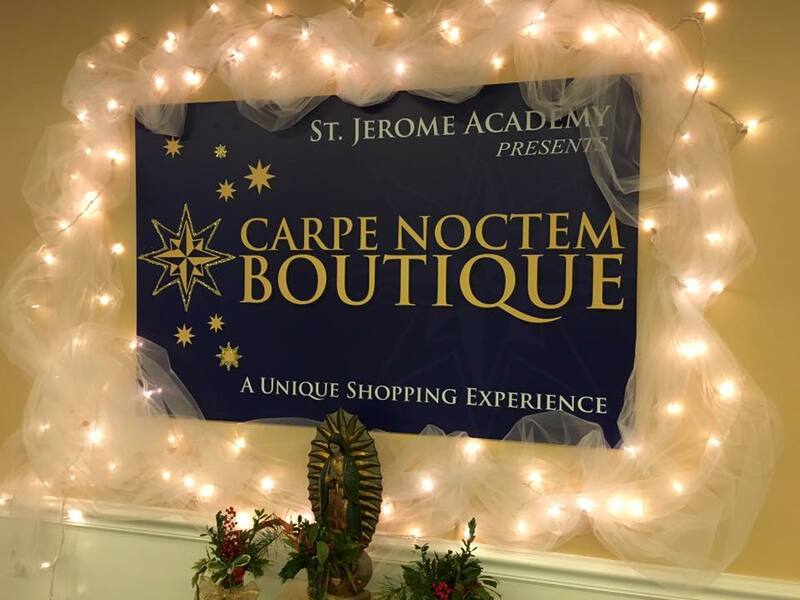 We are excited to announce St. Jerome Academy’s Carpe Noctem Boutique will be held on Saturday, December 5th from 5 to 9 PM. Please mark your calendars and bring your family out to Seize the Night while you sip and shop, perusing the aisles for beautiful, unique gifts. This year, the venue will be expanding into the gym, utilizing two levels of shopping fun! In addition to featuring many talented vendors and LIVE music throughout the evening, various dinner options, wine, beer, tasty desserts, and warm drinks for the kids will be available to purchase. Children can enjoy face-painting, a photo op with St. Nicholas, and coloring activities. Customers will receive a complementary drink with their paid entrance of $5 into the Boutique. All children under 12 are free! The Carpe Noctem Boutique is a wonderful event that supports the students of St. Jerome Academy. The proceeds from this annual fundraising event directly towards helping fund the cost of our children’s education. Community support is vital to our success and St. Jerome’s has been a member of the Hyattsville community for over 50 years. The school prides itself on teaching students in a classical curriculum and is supported by a vibrant and engaged community of families and alumni. When you support St. Jerome Academy, you are not only supporting the school, but the Hyattsville community as well. We are accepting applications for vendors (hand-crafted, artistic, or small businesses). If you are interested in setting up a table at our fun and festive evening, please complete the application and make your payment through your paypal account right from our webpage! We anticipate the table space will go quickly as we have returning vendors already committed and new vendors interested. We had over 35 vendors participate last year! We will once again have a “Bargain Room” of donated gently used, high-end items that would be priced to sell. If you have any home good items that are attractive, updated, gently used or new and could be donated, please contact the school office. Suggested items are designer purses or shoes, lamps, frames, wall art, new electronic devices, full sets of dishes, beautiful platters, barely used rugs, children’s toys or games, or most any gently used items. St. Jerome Academy is located at 5207 42nd Place, Hyattsville, MD 20781. Parking is available! Please enter from 43rd Avenue for parking. More vendors added! Less than 24 hours until our space is filled. Happy shopping!